The Walt Disney World Resort has been trying hard to make their guest's vacation experience more interactive and individualized. This is being accomplished through a series of interactive attractions, queues, and activities. One such interactive activity can be found in Epcot's World Showcase. The world of Disney's Phineas and Ferb comes to Epcot in the form of Agent P's World Showcase Adventure. 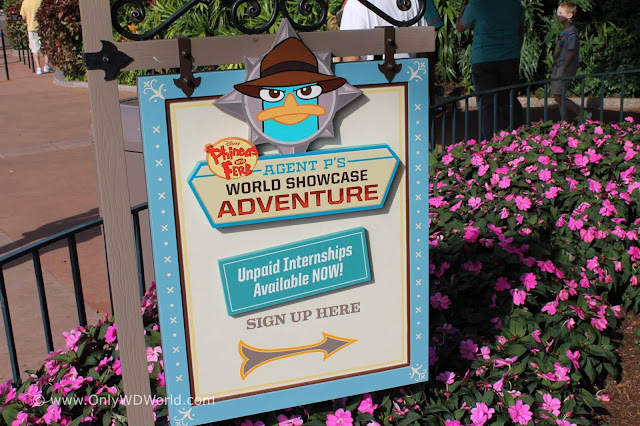 This interactive activity teams up Disney World guests with Perry the Platypus's alter ego, Agent P, in a fun filled adventure that takes them to various lands of the World Showcase to explore it like they never have before. This sign is your call to join the fun and start your own adventure! 0 comments to "Signs Of Disney World: Phineas and Ferb Agent P's World Showcase Adventure"